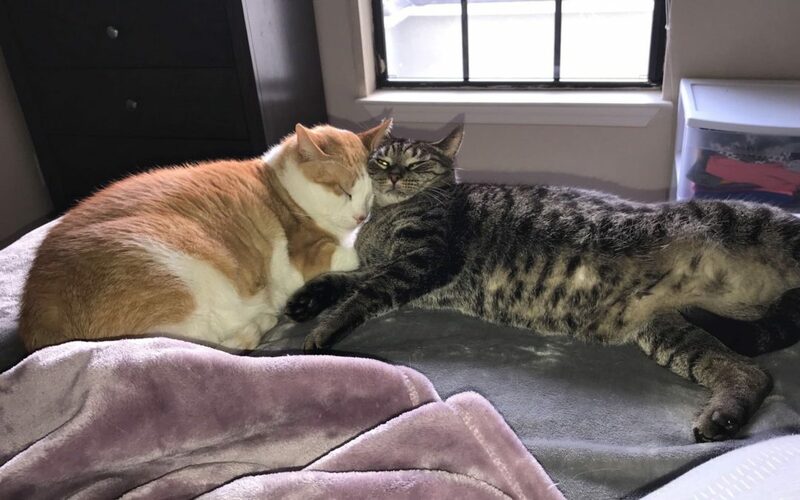 Mr. Whiskers and Muffin found a foster in FL! Christina is a member of the US Navy who is preparing for a 6 month deployment which will take her away from her Jacksonville, FL, home from 4/1/2019 – 10/1/2019. Christina is looking for a temporary home for her two lovable kitties, Muffin and Mr. Whiskers. Muffin is a 6 year old, 16 lbs, male neutered domestic shorthaired cat. Muffin is the lovely orange cat in the photo. Muffin is a tough guy with a big heart, according to Christina. He’s the boss of his brother, Mr. Whiskers, but is still a gentle guy who plays nicely with his brother and LOVES to snuggle. Muffin loves to sleep and wrestle, and will seek out a person to snooze on their lap. Just like his brother, Muffin loves to cuddle with people and would do best in a home with a big comfy couch or a person who doesn’t mind kitties in the bed. Mr. Whiskers is a 6 year old 12lbs male neutered domestic shorthaired tabby cat. Mr. Whiskers LOVES to be held, more than any other cat Christina has met before. He is incredibly friendly and loves to cuddle with people and play with his brother. Both kitties seem like snuggly, playful guys that would do very well in a cat-friendly home! If you are interested in fostering wonderful pets like Muffin and Mr. Whiskers, please fill out a Foster Family Application. If you are interested and have already completed your Foster Application, please email info@pactforanimals.org and let us know!